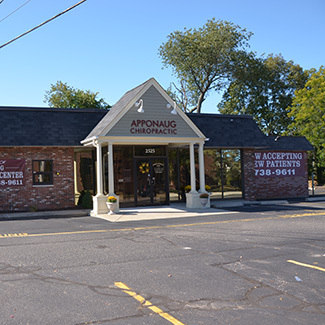 Since he opened Apponaug Chiropractic Center in 2000, building it from the ground up, Dr. Christopher Caliri has been steadfastly committed to providing his patients with high-quality, life-changing chiropractic care. Whether you want to get back in the game, play with your children, or simply be able to perform your daily activities, we will help you regain your function and achieve your goals. From days-old newborns to spry seniors, patients of all ages can benefit from noninvasive, drug-free chiropractic care. While we do an excellent job of providing pain relief, our primary goal is to help patients achieve optimal health and wellness that comes with maintenance care. From carpooling and commuting to deadlines and other everyday duties, we all lead busy lives. Because we understand that you are often pressed for time, we are pleased to offer patients convenient appointments. We open at 7:30 a.m. on Monday, Wednesday and Friday, and are open two Saturdays every month from 9 a.m. to noon. Another way that we make care convenient for our patients is by offering on-site digital X-rays, so you do not have to drive elsewhere. Find out for yourself how much better you can feel with safe, natural and effective chiropractic care. Book a convenient appointment at our chiropractic care center in Warwick.